Since August has been a full-blown scorcher, I try to minimize any time cooking and instead make fast, easy meals. This one is a winner – it is easy and delicious. 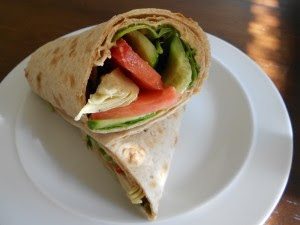 If you can’t find lavash bread (a rectangular flat wrap), you could use any tortilla or wrap that you would like. I love cheesecake and could eat it with every meal. 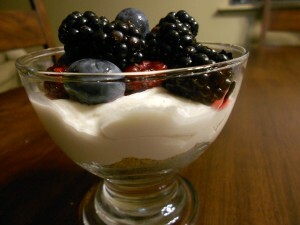 This vegan version, is simply delicious and it is easy to make too – no baking in an oven like the old-fashioned cheesecake, just putting everything into adorable parfait dishes. After making the cream, you just put this in parfait dishes, toss it in the freezer and in 15 minutes, you have a delicious dessert! Too good to pass up and very impressive! Jessica Brockmole’s Letter’s from Skye is a breathtaking epistolary novel that captivates readers from start to finish. Beginning when David Graham, a young American college student, writes a fan letter to Elspeth Dunn, a Scottish poet, the novel is set in the years leading up to World War I. The letters between the two cross the Atlantic from Illinois to the Isle of Skye, and show a growing friendship that eventually becomes blossoms into a heartfelt relationship, only to be interrupted by the outbreak of war. David, or “Davey” as he is known, is not sure what to do with his life, and is drawn to the risk and excitement of serving as a volunteer ambulance driver in France. Through their communication, these two individuals grow in respect and love for one another, but Elspeth’s fears for Davey’s safety, and concerns about her own ability to be accepted by her family and community begin to darken the pages of their letters. Twenty years later, Elspeth’s daughter Margaret has fallen in love with a childhood friend who has gone off to fight in World War II. Elspeth, fearing for her daughter’s heart, warns Margaret not to fall in love during wartime. After an attack on Edinburgh and an argument with Margaret, Elspeth vanishes one night, leaving only a handful of clues for Margaret to unravel. Determined to find her mother, and understand the “first chapter” of her mother’s life, Margaret searches for Elspeth, unraveling the mysteries of Elspeth’s family and her own father’s identity. At once heartbreaking and uplifting, Letters from Skye is a moving novel with compelling characters, a unique plot, and unexpected twists. The letters (both the sets between Elspeth and Davey, and those between Margaret and her fiancee, Paul) are touching in their depth and tenderness, and readers are easily transported to the shores of Skye during World War I, and the hustle of Edinburgh during World War II. This book is incredibly hard to put down, and will stay with you long after you are finished. 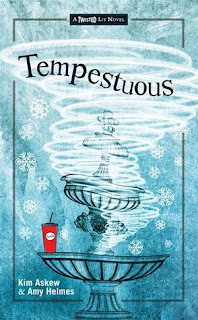 Tempestuous by Kim Askew and Amy Helmes is a delightfully contemporary take on Shakespeare’s The Tempest and is an engaging addition to any young adult library. The island has been replaced by a shopping mall, and the characters are a disparate band of teenagers, but the plot is just as enticing. After Miranda Prospero is blamed for a school-wide cheating scheme, she is forced to take a humiliating job at a mall food stand in order to pay for damages. There, she works beside sylph-like Ariel, a homeschooled student who is perpetually positive, and adores Miranda for her insights into high school life. On this particular winter night, Miranda meets Caleb, a dark and moody teenager who works at the mall’s magic shop. Wanting nothing to do with him, Miranda shows him her predictably arrogant attitude beginning an escalating tension between the two. As the snow falls down and the mall traffic all-but-stops, Miranda realizes that some of the only customers left are her former best friends, and ex-boyfriend, all four of whom seem bound and determined to make her life miserable, mocking and ridiculing her every chance they get. Just when it seems as if the night cannot get worse, Grady, the security guard tells everyone that the mall is on lockdown; with four feet of snow expected by sunrise, it is not safe to leave the mall premises. What unfolds is a series of unexpected events (a bit too crazy to be believable, but fun just the same) with likeable characters, and intriguing parallels to Shakespeare’s original play. With a robber on the loose, a birthday that must be celebrated, and a pair of handcuffs that bind two unlikely friends, mayhem ensues. While the story in general is a bit predictable, it is a wonderful way to introduce younger audiences to Shakespeare’s works in an enticing and fun way. This may be the most enjoyable way to get students prepared for the coming school year. As a fan of delicious new foods and volunteering, I was thrilled to receive the first Love With Food box of my new subscription. I had heard about it before, but decided that with the new school year starting, this would be the perfect way to get some fun snacks for my lunches, so I went ahead and purchased a subscription. I loved it (really and truly – honestly, this is not an advertisement). It featured everything from delicious breath mints to organic potato chips, and from a mini waffle to a gourmet nut mix. Because I loved my box so much, I wanted to share a special offer that came in my box. Anyone who signs up by clicking on the banner above will get their first box for as low as $5. 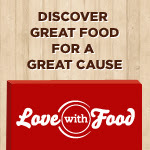 That is $5 (with free shipping) for a delicious box of healthy snacks, and with your purchase, a box is donated to help feed those in need around the country. It really doesn’t get better than that. Just click on the link above to get started. Enjoy! We have now switched camera views for the San Diego Zoo Safari Park’s Condor Cam. 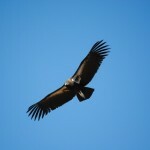 As faithful viewers, you have been able to watch our California condor chick, Cuyamaca, hatch and grow in her nest box. Now, you are able to view her out in her flight pen with her parents, father Sisquoc and mother Shatash, because Cuyamaca has taken the next exciting step in her development: She has fledged!